What is Online Property Management Software? Online Online Property Management Software is created for businesses and landlords to help manage real estate anywhere and at anytime. With solutions for rent collections, maintenance, tenant screening, accounting, vacancy listings and more, Online Property Management Software is the complete solution for you and your tenants. If you’re looking for online software similar to Online Property Management Software, consider our Building Maintenance or Facility Management Software categories. 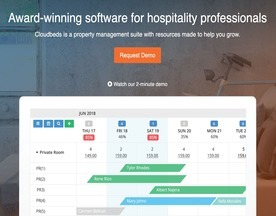 All-in-one hospitality management system that connects your property to hundreds of channels with real-time, two-way integration. We are the no-sweat, all-in-one hotel management system that makes you more money, saves time, and makes guests happier.